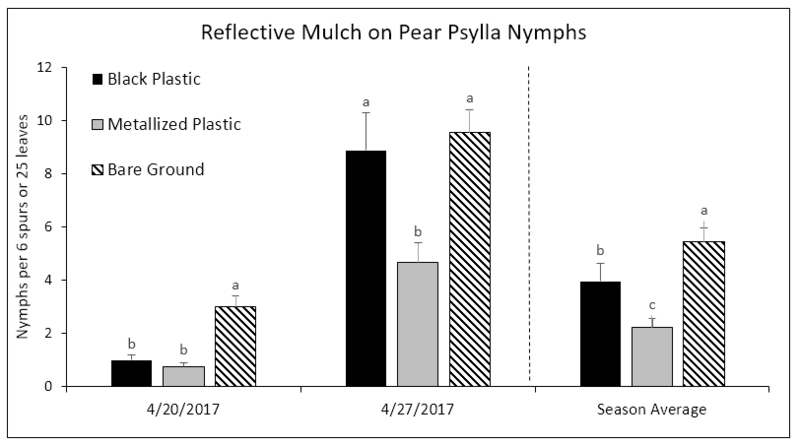 In this experiment we evaluated a non-spray method for managing pear psylla: reflective plastic mulch. The reflective plastic mulch used in the experiment is a thin polyethylene film infused with aluminum manufactured by Star Metal Plating Inc; one side is reflective while the other is black (referred to as ‘metallized”). When laid on the ground with the reflective side facing up, light is reflected back up into the canopy, which may deter psylla adults from colonizing and ovipositing. Past research has demonstrated that this technique reduces densities of various insects in multiple crops, including the closely related Asian citrus psyllid. 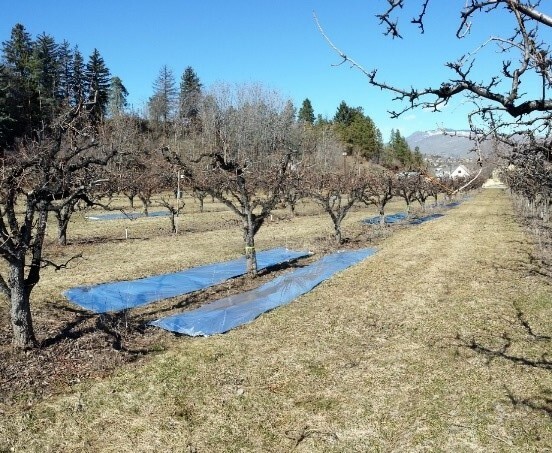 In addition to insect control, reflective ground covers can provide horticultural benefits in pears such as early fruit onset, increased flower bud formation and yield, and greater fruit production in lower portions of the canopy. Three treatments were tested: ‘metallized’ plastic, black plastic, and bare soil. Each plot consisted of one tree with two 4 × 25 ft sheets of plastic laid on each side (Fig. 1), or no plastic for control plots. There were 6 replicates of each treatment. Adults, eggs and nymphs were counted weekly (data collection is ongoing). Data will be collected for the remainder of the 2017 season, but initial results show clear treatment differences. 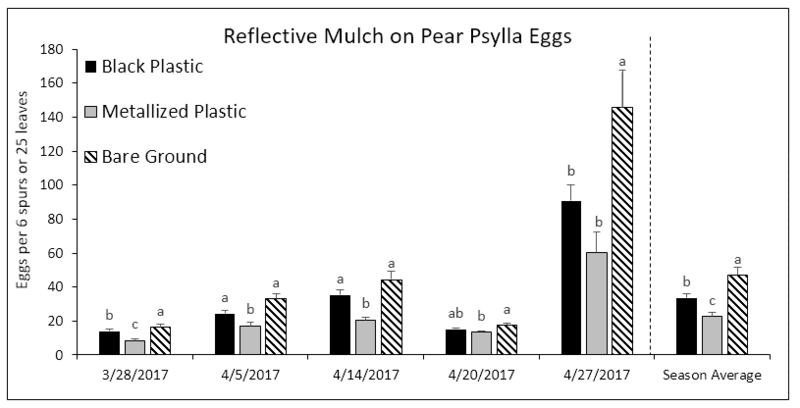 Metallized mulch plots have shown significantly lower densities of adults (Fig 2), eggs (Fig 3) and nymphs (Fig 4) throughout the early season. 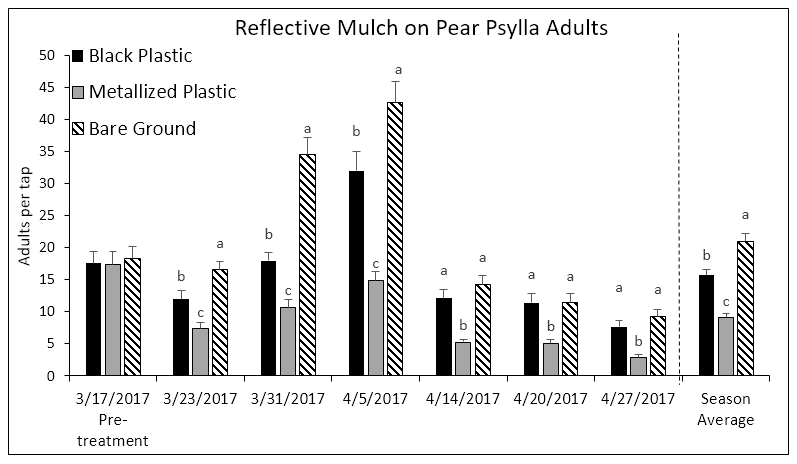 Black plastic mulch generally had fewer psylla than bare ground, but reductions were less substantial than those from metallized plastic. Fig. 2. Average number of adult pear psylla per 18 x 18 inch tray. Bars within a column that do not share a common letter are significantly different. Fig 3. Average number of eggs per 6 spurs or 25 leaves. Bars within a column that do not share a common letter are significantly different. Fig 4. Average number of nymphs per 6 spurs or 25 leaves. Bars within a column that do not share a common letter are significantly different.